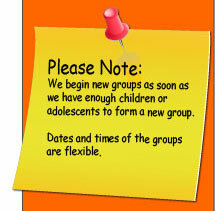 The Social Skills Group Help your child to make changes in their behavior. Many children have a difficult time making and keeping friends. Children who are having these experiences need to learn a new way of “thinking” and a new way of “behaving”. They need to better understand behaviors in themselves and others. How does a child make the decision to make changes in his behavior? First, someone has to believe in their ability to change. Your belief and confidence in your child is the magical ingredient in helping them to see themselves differently. Teaching children alternatives to handle conflict will give choices in future situations. Here are steps to help a child work through the process of change. Help your child to make the decision to stop acting in ways that hurt or bother others. (They will feel good about making positive choices!) What could my child be doing, behaving, thinking or saying around other ‘kids’ that may bother them or not attract them to be their friend? Remember, children need attention. They want attention from other children and to feel connected. They want to feel connected to their parents and other adults supervising them. We need to tell our children what we see is right in their behavior, NOT what is wrong. We need to tell them they are doing a good job. Why should they get attention for what is wrong? Why not give it to them when it is RIGHT and ignore what is wrong? Children will go about getting attention any way they can. So give it to them for what is RIGHT and they will do more RIGHT. Often adults ignore the children when things are going well... They are tired and glad to have a break. And that is exactly the time when we need to make a fuss. And we will get more good behaviors. Whatever we think about we seem to bring about. Let us help our children think about what is well and right with each day. Let’s give our attention to a nice day, good health, well being and getting along well with others.